The main difference between Oracle and DB2 architecture is that the Oracle architecture refers to the standards and functionalities that define the way of collecting, storing, and organizing data of an Oracle RDBMS developed by Oracle. Whereas, the DB2 architecture refers to standards and functionalities that define the way of collecting, storing and organizing data of a DB2 RDBMS developed by IBM. Oracle is an RDBMS developed by Oracle Corporation that is used for online transaction processing and data warehousing. DB2 is an RDBMS from IBM that operates on various operating system platforms. Let us see the difference between Oracle and DB2 Architecture in this article. Oracle architecture includes physical, memory components, processes, and logical structures. Oracle server is capable of managing a massive amount of data. It can allow multiple users to access the same data simultaneously. The server consists of instances and databases. Moreover, the instance is an executable that runs as an operating system. An Oracle database has files such as data files, control files, log files, etc. It also has parameter files and password files. These files allow system users to process SQL statements. They also help to improve performance. Furthermore, it is possible to use these file to recover the database in a failure. Furthermore, there are user and server processes. They help to execute SQL statements. There are two types of processes as shared server processes and dedicated server processes. The shared server process can share memory for multiple user processes. The dedicated server process can manage memory for a single user process. DB2 is a relational database system of IBM. It helps to store, analyze and retrieve data efficiently. Important components of the DB2 architecture are as follows. On the client side, the DB2 client library helps to connect the local or remote application to the database. Local clients communicate using shared memory while remote clients communicate using a protocol such as TCP/IP. On the server side, components called Engine Dispatchable Units (EDU) handle activities. DB2 agents manage SQL processing. It is also an EDU. It is possible to assign multiple subagents to process client application requests. A pooling algorithm manages all the agents and subagents. It reduces EDU creation and destruction. There are buffer pools available in the database server memory to store temporary data (user data, catalog data, index data, etc.). They help to access data faster from memory than accessing data from the disk. Therefore, buffer pools help to increase the performance of the database. Other important EDUs are Prefetchers and page cleaners. They obtain data from disk and send them to a buffer pool before applications require data. Furthermore, page cleaners move data from a buffer pool back to the disk. If there are no prefetchers and page cleaners, the application agents have to perform all data reading and writing among buffer pool and disk storage. Oracle architecture is the collection of policies, standards, and functionalities that define the way of collecting, storing, arranging and integrating data of an Oracle RDBMS developed by Oracle. DB2 architecture, in contrast, is a collection of policies, standards, and functionalities that define the way of collecting, storing, arranging and integrating data of a DB2 RDBMS developed by IBM. Thus, this is the fundamental difference between Oracle and DB2 architecture. 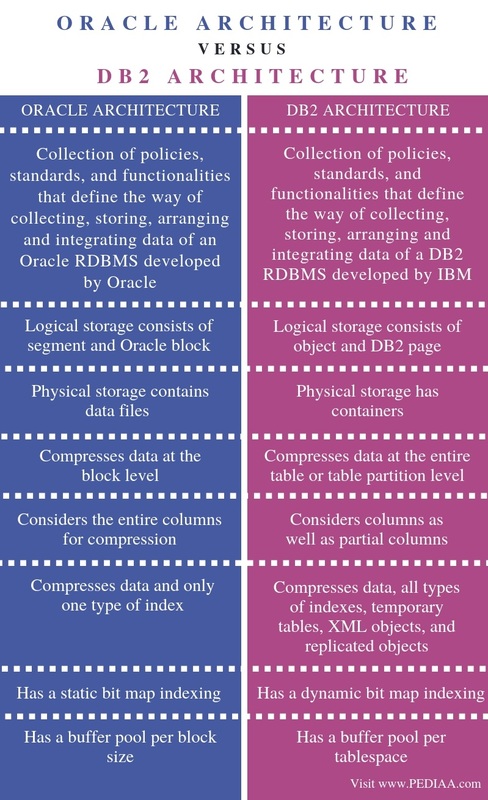 Logical storage structure is a major difference between Oracle and DB2 architecture. Oracle logical storage consists of segments and Oracle blocks while DB2 storage consists of objects and DB2 pages. Physical storage structure is another difference between Oracle and DB2 architecture. Oracle physical storage contains data files whereas DB2 physical storage has containers. Moreover, Oracle compresses data at the block level, but DB2 compresses data at the entire table or table partition level. Also, while Oracle considers the entire columns for compression, DB2 considers columns as well as partial columns. Hence, this is one other difference between Oracle and DB2 architecture. Besides, Oracle compresses data and only one type of index. However, DB2 compresses data, all types of indexes, temporary tables, XML objects, and replicated objects. Furthermore, Oracle has a static bit map indexing while DB2 has a dynamic bit map indexing. While Oracle has a buffer pool per block size, DB2 has a buffer pool per tablespace. Oracle architecture refers to standards and functionalities that define the way of collecting, storing, and organizing data of an Oracle RDBMS developed by Oracle. DB2 architecture, on the other hand, refers to standards and functionalities that define the way of collecting, storing and organizing data of a DB2 RDBMS developed by IBM. That is the main difference between Oracle and DB2 architecture. 1. “Module 1 – Oracle Architecture.” Desk Manager, Available here. 2. The Analytics Maturity Model (IT Best Kept Secret Is Optimization), IBM Corporation, Available here. 3. “Oracle Database.” Wikipedia, Wikimedia Foundation, 30 Jan. 2019, Available here. 4. “What Is DB2? – Definition from WhatIs.com.” SearchDataCenter, Available here.